A new school year is starting which means it's time to deck out your dorm room! When I went to college I remember picking out my dorm room bedding with my college roommate. I read so many lists about what to bring and what not to bring to school, and my head was spinning. And, seriously who has XL twin bedding lying around their house? Of course, if you do have XL twin bedding lying around by all means it's always best to use what you already have! But, it's also a really fun time to decorate your own space! You can stock your dorm room with some zero waste essentials like a reusable water bottle, coffee mug, cloth napkins and a tiffin so you're fully equipped. I've picked some of my favorite eco-friendly dorm room pieces for the minimalist, the wellness guru, and the boho gal. Some of the links included in this post are affiliate links for more information head to my disclosure page. 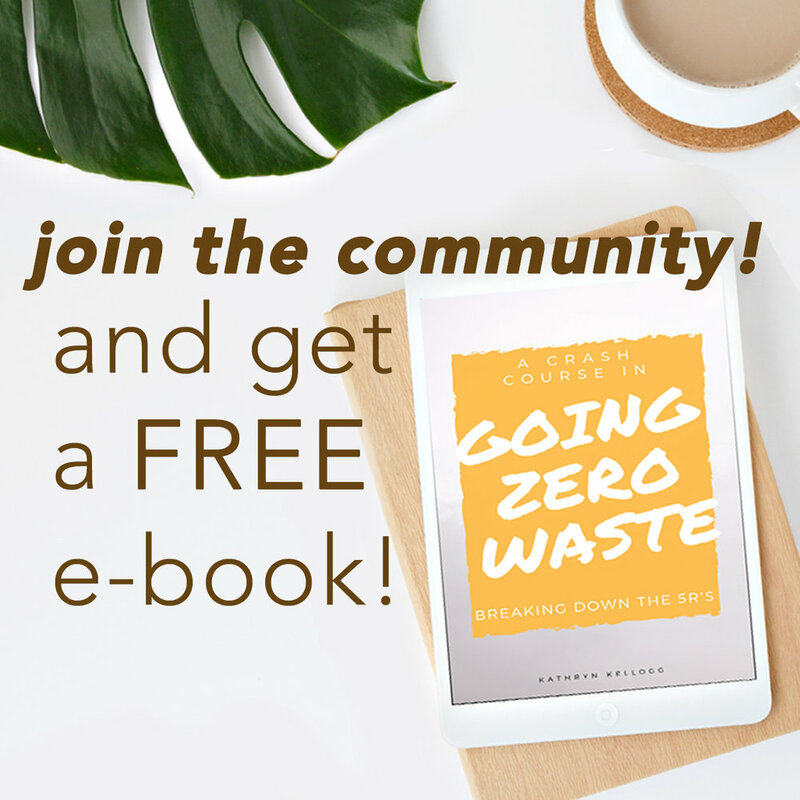 If you're headed off to school, make sure to check out my top 10 tips for going zero waste in college. This dorm room guide was inspired by Gittemary from The Picture of Mary. vintage rugs: Hit up the local thrift store or head to the nearest garage sale, I bet you could find some gems! I really like this one on Etsy. I love the warm orange tones and they give off a total hippie boho vibe. macrame wall hangings: I love macrame wall hangings and this one has hints of cobalt blue and rust, just like the rug. poufs: Poufs are great because it can double as seating or pillows! Perfect for hosting a late night movie party or propping you up during a study sesh. These poufs are made from organic cotton and vegetable dyes. vintage sari throw: I just found out about the Anchal Project, and I'm obsessed. Their bedding and throws are made from vintage sari's are gorgeous!! This is my pick for the boho gal. silk scarf curtains: These silk scarf curtains are so cute! But, you could totally go to the thrift store and pick up some darling silk scarves and stitch them together! Or use your own silk scarf collection as dorm room decoration! Make them a centerpiece by hanging them creatively in plain sight. You'll not only have unique wall decorations, you'll never fail to have a beautiful scarf for your outfit or bag! This dorm room guide was inspired by Alison Wu from Wu Haus. ceramic mugs: These adorable mugs are perfect for you and your roommate to sip tea in between classes. yoga mat: Manduka yoga mats have a lifetime guarantee perfect for good morning stretch routines to limber up before class. The yoga mats are made from natural rubber and are non-toxic – a zero wasters dream! Don't forget to pick up the cork blocks too. pastel wall art: I love these gorgeous pastel and gray prints with their geometric shapes. Of course you could definitely get together with a group of friends and paint some gorgeous pastel prints for your dorm rooms. meditation cushion: Even a dorm room can have a meditation nook, create the perfect space to practice mindfulness with a meditation cushion, a blanket and some greenery like an aloe vera plant to ground your spirit throughout the term. This natural buckwheat cushion is wrapped in an outer layer of organic cotton and has a handle to easily carry your cushion to a meditation sesh in the quad. organic cotton throw: I've picked out another Anchal Project throw because I'm obsessed. Their work is amazing, and this color blocked quilt is my pick for the wellness guru. portable standing desk: If you're into wellness, then you know sitting is the new smoking. It's important to get more standing into your study routine. This foldable and portable standing desk is just what you need. Perfect posture on the go - bonus points - you can practice your mountain pose while you study. This dorm room guide was inspired by Christine from Snapshots of Simplicity! rug: Take inspiration from Japanese tatami and choose a simple rug that is hardwearing and completely natural like a 100% jute mat. It will last long after you graduate and can be composted at the end of its life. blanket: My Anchal pick for the minimalist dorm room is one that really sets the tone with a black and white pattern. plants: Less is more - that's kind of the minimalist M.O. But, when it comes to plants - go crazy get two even three! Plants are simple zero waste decorations that filter the air and provide a nice pop of green. A hardy aloe vera plant adds a touch of nature indoors and won't die easily. Plant it in a gorgeous ceramic planter that you can keep with you long after you graduate. hangers: These hangers are an upgrade from the plastic flocked hangers everyone raves about for saving space. These are flat and made from 100% pre-consumer waste meaning they come industrial waste. metal clips: Pick up a set of metal clips and use thumb tacks or jute twine to string them across the wall. You can hang photos of your friends that you took with your polaroid or your syllabuses to be reminded when your assignments together. Which one is your favorite? I'm super torn - they all look so good! !